Health professionals recommend that kids and teens get sixty minutes of exercise each day, but few of them do – especially young girls. In fact, by the age of seven, girls are already starting to become less physically active than boys. This disparity widens as they grow from childhood into adolescence with the biggest drop occurring from primary to secondary school. This is attributed to changes in friend groups and declining body confidence. Regular activity for girls is not only important for health reasons such as reducing the risk of heart disease, obesity, and diabetes, but it also increases well-being, focus and self-confidence. Check out these fun games for girls to your young girls moving and staying physically active. When kids are having fun, they don’t even notice that they are getting exercise. Make a list of exciting, active games for your girls and stick it on the fridge for when they get bored. Include a good variety of activities such as some games that can be played outside and some that can be played inside, some that involve a few kids and some that are good for a larger group. Fun activities to add to the list are hide-and-seek, relay races, bike riding, scavenger hunts and dance contests. And, don’t think that girls won’t like some of the same activities that boys do. Your girls just might love some of these games. 1. The Play-Platoon mini basketball hoop is made to hang over a door for indoor play. Make it a challenge by playing “horse” or hosting a two-on-two basketball tournament for a few friends. Available on amazon.com. 2. Ultrafoam Indoor Bowling Set is bright, safe and perfect for active play both indoors and outdoors. It comes with everything you need to set up your own bowling alley – one ball, one set-up sheet, ten pins, and a carrying case. Available on amazon.com. 3. 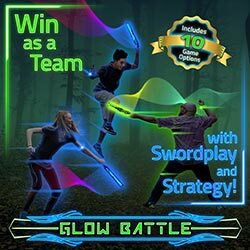 Glow Battle, the light-up sword dueling game, is an awesome way for a girl to act like a warrior hero while getting exercise. Players wear glow in the dark bracelets and use strategy, teamwork, and their own warrior instincts to team up and take down their opponent. Join the hundreds of Kickstarter backers in this action-packed game! Purchase Glow Battle here. 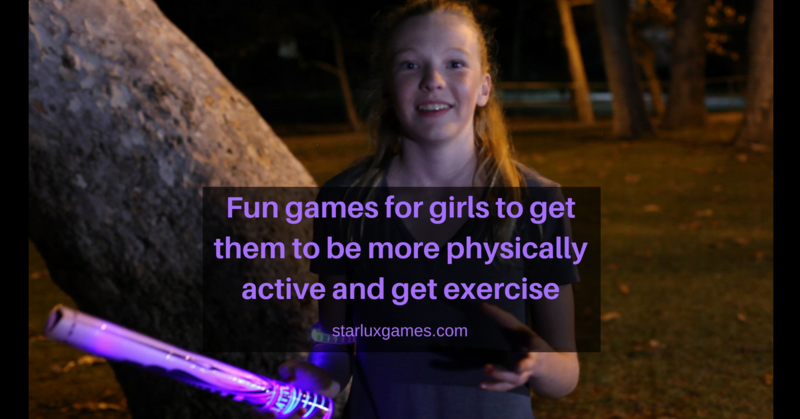 There’s a never-ending list of ways to stay active outside and there are so many interesting things to do outdoors that can keep girls hopping. Literally, you can keep them hopping with a fun game of hopscotch, jump rope or trampoline tag. You can also keep them moving with some of these entertaining and engaging outdoor games. 1. The Champion Sports Skip Ball Set includes six ankle ring swing balls that are great for skip-jumping. In addition to burning energy, they help improve coordination and motor functions. The hardest part of this set is deciding which of the six fun colors to choose. Available on amazon.com. 2. Capture the Flag REDUX. 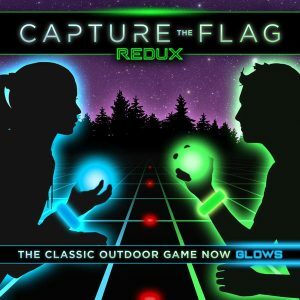 This fun, futuristic twist on the classic Capture the Flag game is perfect for keeping both girls and boys active as they break teammates out of jail, sneak into enemy territory, protect base and steal the glowing flag to win. 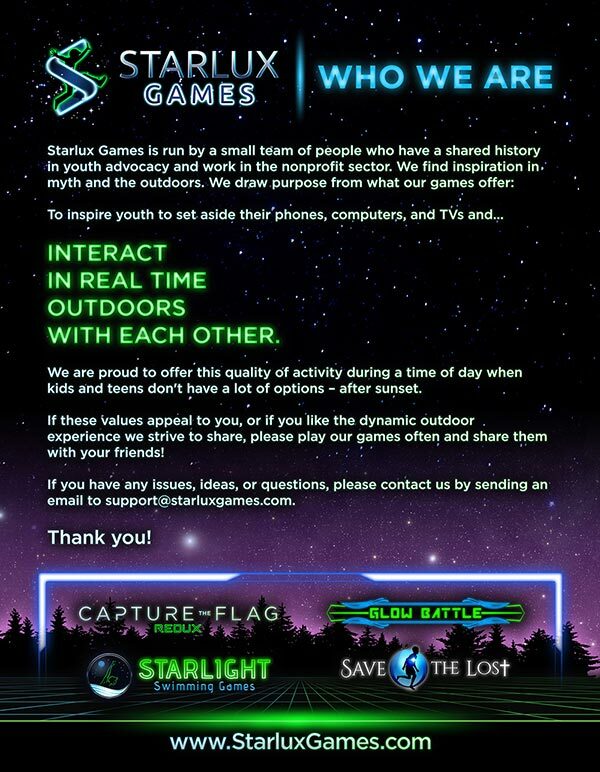 Each game box includes two glowing orbs to use as the “flags,” color-coded LED bracelets to differentiate team members, glowing jail markers, and a rulebook. Available for purchase here. 3. Wearable Inflatable Bumper Zorb Balls. It’s hard not to have fun when you are wearing these giant bubble soccer suits. They make for a great physical outdoor activity that encourages coordination, balance, and a lot of laughs. Available on amazon.com. To keep your young girls interested in staying active, keep your activity list fresh and mix it up with all kinds of action-packed activities. If your girls like to hike, find some new nature trails or parks to explore. If your girls like to compete, create your own backyard obstacle course. And, if your girls like to dig in the dirt, plant a vegetable garden. Try different takes on things that they already like to do, as well as introduce them to new things and watch how their love of activity grows. Here are a few new activities that they just might find amazing. 1. Adjustable Illuminating Inline Skates keep girls rolling with cool light-up wheels and easy-to-put-on buckles. Parents will love the adjustable fit and the ankle support that they offer. Available on amazon.com. 2. 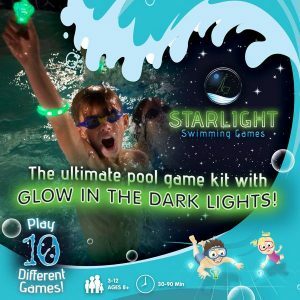 Starlight Swimming Games are ideal for keeping girls active in a swimming pool. They can play ten different swimming games like Human Whirlpool and Flower Push Relay with the enclosed waterproof glowing games pieces and instructions. Simply twist each light on and toss into the water for hours of fun. Click here to learn more and purchase online. 3. The Floor is Lava game is anything but a sit-down board game. It gets kids jumping, leaping playing and laughing. It comes with 25 colored foam “safety stones,” 27 challenge cards, a game spinner, and instructions. Available on amazon.com. Most importantly, stick with it. Keep young girls consistently physically active by encouraging sixty minutes of exercise every day, whether it be with an organized sport, fitness class or fun activity. Encourage them to keep track of their exercise with a fitness journal or activity calendar so they can see their progress. Take pictures of the fun activities that you all have done together and add them to the journal. And, remind your girls that staying physically active will help them to stay healthy, do better in school and be more confident.